Retailers in brick-and-mortar environments are consistently challenged to increase productivity to compete within the industry and against online retailers. This means they expect their sales associates to do more than handle the registers or stock shelves. Fortunately, in today’s omnichannel retail environment, technology enables associates to provide personalized service for customers while increasing their efficiency on the floor. When floor traffic is slow, senior-level sales associates need to be able to easily shift to handling administrative tasks such as answering customer queries or communicating with store executives. A 2-in-1 device enables associates to be productive in laptop mode during slow times, but easily switch to tablet mode when on the shop floor engaging customers. It used to be that stores could simply send associates home when business was slow. Some retailers have used traffic analysis to staff the minimum number of associates needed — a “misuse of technology,” according to Retail Dive, as reducing staffing can leave the store unprepared for an unexpected increase in traffic. Download this white paper to learn how to best meet the mobile device needs of your workforce. To address this challenge, retailers such as Costco have found administrative tasks and other duties for these employees to perform during slow times. This boosted revenues and profits to the point that Costco can afford to pay workers more than the industry average. Having technology on hand can also help enhance the overall customer experience. Britton Marketing & Design describes how Nordstrom and Neiman Marcus have introduced the concept of co-shopping: A customer connects with a sales associate via email or social media prior to visiting a physical store, and the sales associate can access any customer information, including product preferences, loyalty information and, if provided, a customer photo, which helps identify the customer when they’re in the store. 2-in-1 devices are one technology development that offers many advantages to sale associates. Today’s 2-in-1s feature bright, high-resolution displays, enabling retail associates to better help customers decide between color choices before retrieving an item from the back of the store for them, or ordering it from a warehouse location. Multitasking employees can also switch to laptop mode, docking in to the keyboard on the 2-in-1 when the store is slow to answer customer emails or input catalog inventory, which can be done faster on a laptop than on a tablet. Additionally, employees can use the 2-in-1 to access core Microsoft Office applications for word processing, spreadsheet and other productivity tasks that are easier to use with larger displays and keyboards. Another advantage is that 2-in-1s offer robust storage capabilities, more so than is available on a tablet. And with Windows 10 Pro, they also offer the latest operating system capabilities, and mobility that enables associates to move throughout the store and switch seamlessly between showing products to customers and working on administrative tasks. In smaller retail operations, and increasingly in larger stores as well, associates with more involved management responsibilities are doing double duty on the store floor and in backrooms or small offices just off the floor, so they can work on items like reviewing and editing spreadsheets and processing payroll when they’re not meeting with customers. However, 2-in-1 devices enable managers to perform these duties from anywhere, so they can serve customers and complete back-office tasks in a timely manner without having to travel back and forth from the office to the store floor all day. Similarly, in owner-operated shops or small specialty stores, owner-operators and senior managers may be on the floor only rarely, but can still benefit from the versatility of a 2-in-1 device. The touch-screen display of the 2-in-1 enables executives and vendors to see products in different colors and styles as they’re making shop display decisions. It also allows for the ready design of marketing materials, which owners and managers can then annotate or easily attach to emails or other customer marketing messages using the keyboard. The need to further leverage sales associates’ time while in stores will continue to grow as retailers look to maximize the profits from their retail locations in the wake of rising competition from e-commerce and other retailers with physical locations. 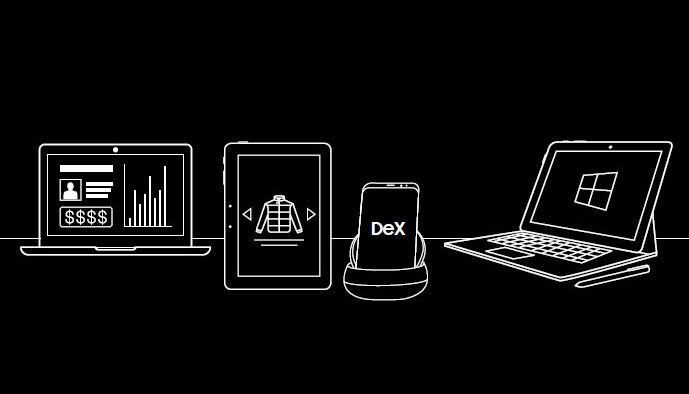 Providing associates with 2-in-1 devices is an important element of improving brick-and-mortar performance, increasing employee productivity and advancing technology within the retail space.